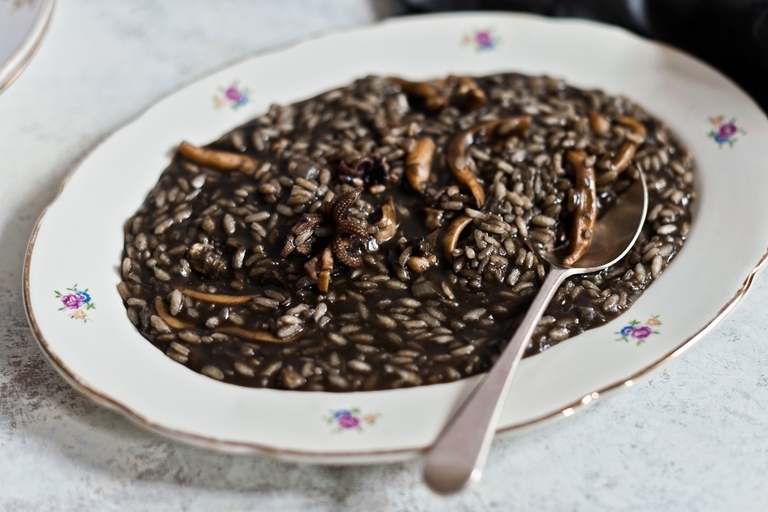 This stunning squid ink risotto recipe is a Venetian classic, with bountiful squid offering the moody ink that gives the dish its famous colour. You may need a little extra squid ink to boost the colour if the sacs of the squid are a little small, so it's wise to keep some extra on hand. One of the most iconic and famous Venetian dishes, squid ink risotto, impresses the eye as much as the palate. For those who have never seen or tasted it, the first encounter is revealing: gazing at the pitch-black plate of rice approaching the table is a show in itself; the flavour – earthy, deeply savoury, and yet strikingly sweet – does the rest. The core of the dish is squid with its ink sacs attached. In Italy, inky squid is not hard to come across. Featuring heavily in the cooking repertoire of many regions, you’ll often be able to spot it, the pearlescent flesh stained with black, in most coastal markets across the country. In Venice and Chioggia, too, black squid is common sight, as locals use it to make traditional dishes like risotto and black squid stew. When squid ink is not available, however, I found that bottled ink works as a fine replacement; it also acts as a great colour enhancer when the natural ink contained in the squid isn’t strong enough to colour a whole pot of risotto. This risotto recipe comes together in two steps. On the one hand you have the main act – the squid, braised in its own ink, wine, and a little tomato until melting-tender. On the other you have the rice, started off simply and then mingled with the squid sauce to form a thing of pure magic. To finish, a knob of butter goes in, but no Parmesan, so as to not overpower the sweetness of the squid. The risotto is then served ‘all’onda’ (spreading on the plate like a smooth, gentle wave) with a shy sprinkle of parsley and a couple of turns of the pepper grinder.